Ben and Nancy met seven years ago, and they have been enjoying every moment of life together ever since. As with all sailors, Nancy and Ben had caught the itch. And how could they not? Spending your days in the beauty surrounding the Virgin Islands, all while admiring the beautiful sailing yachts cruising from island to island. It is only natural that they were inspired to achieve this lifestyle. Would it even be possible to dream up a better retirement plan than this? And while dreams are great, it is the work that you put in that turns your dreams into a reality. And when searching for the perfect yacht for you to live out your dreams, I have yet to meet a yacht owner who found the process to be simple. With so many options to choose from, you must narrow down what it is you are looking for. "We started investigating and researching catamarans online. There was an incredible picture of the interior of a Leopard 48 that we came across and after further research, we decided to go to the Annapolis Boat Show and tour the boat. It was love at first sight. 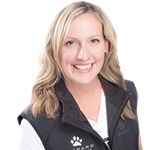 We fell in love with the well-designed, roomy and light interior, and mostly the walk through salon which, to us, is the best design to a catamaran that you can find, especially considering we have two good sized dogs-- Boulder and Miles. And that officially started our three year journey to get our boat," Nancy shares. So you've got the dream, you've got the boat, but what next? Experience. The best way to gain experience is by doing. Ben and Nancy both had experience on smaller monohulls, but when you are considering a yacht that is 48 ft. in length and 25 ft. wide, it'd be safe to safe you need some practice. Nancy and Ben decided to enlist in an 8 day live aboard catamaran course in the USVI with the American Sailing Association. Nancy explains, "The captain/ instructor was very knowledgeable and we learned so much. But, we were on a catamaran that was not a Leopard. That trip reinforced our decision to purchase a Leopard Catamaran. We looked at competitors but they did not measure up design or space wise." After you gain confidence in your abilities to operate your dream vessel, the research must go on. By now Ben and Nancy had a clear idea of what they were looking for and considered a few more things. "We knew that Leopard supplied The Moorings charter fleet, which helped us realize that they were easy to sail and maintain. Leopards being the only type of catamaran in the world's biggest charter fleet was substantial. We also followed Leopard 48 Owners, SV Happy Together, which helped solidify our decision to own a Leopard." Nancy continues, "The sailing, the traveling, the freedom, it was everything that we were looking for." What Nancy and Ben did not know at the time was that the Leopard 48 would soon be coming out of production. 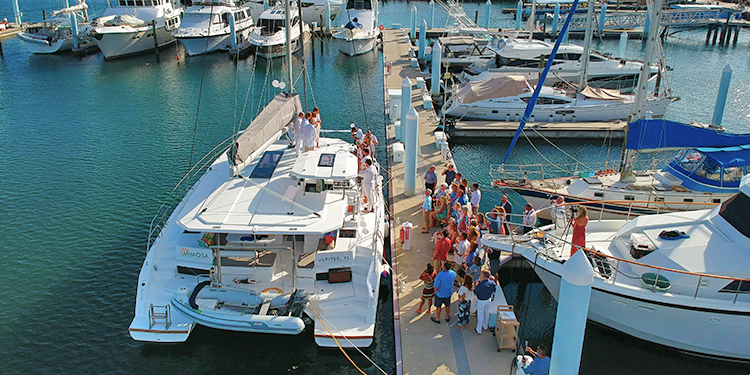 They attended another Annapolis Boat Show and had the opportunity to see the new Leopard 45. They were really impressed with the design, the new features, and the enhancements made to the layout. When the couple was ready to sign contracts, although disappointed that the 48 was no longer in production, they jumped at the chance to purchase a Leopard 45. "As it turns out, I believe we are much happier with the Leopard 45. It is our first catamaran and it fits us in every way," Nancy shares. What I found to be the best part about this whole story was that around the time the couple was waiting for the delivery of their new yacht, they also decided to get married. And what an exciting time! Nancy and Ben planned for the wedding to take place aboard their Leopard 45, Mimosa. They explain, "It seemed like the natural extension to host the wedding on Mimosa. The boat is going to be a huge part of our lives. All of our friends and family were eager to meet her and help us celebrate both our wedding and the new boat. And because we had just gotten her, we decided that this would be the perfect time to christen her and include our family in that celebration too. What would be better than a wedding and a christening, all with the people you love, who will eventually sail with you?" 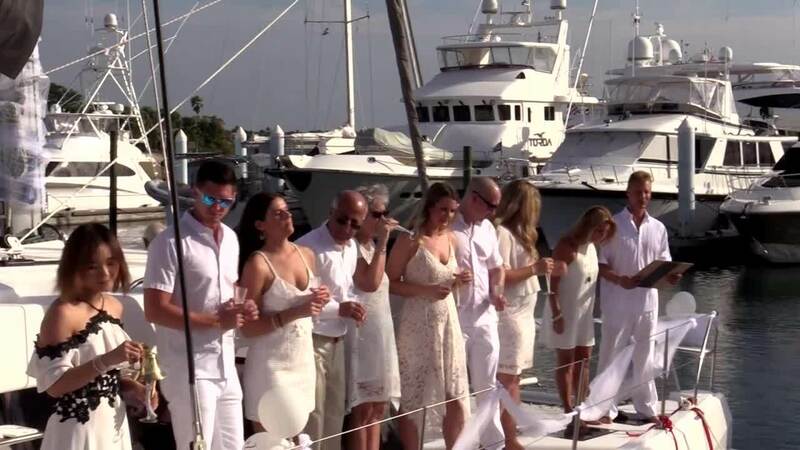 The wedding took place at their home marina in Riviera Beach, FL. And a celebration it was! The couple got married on the hard top and the wedding party stood on the deck below. They invited close friends and family and the champagne was flowing. The gracious couple ensured that not a single soul had an empty glass. With everyone in the wedding party dressed in a light, fresh look the couple said their vows and everyone shared a toast. Immediately following the nuptials the wedding party took part in the christening ceremony while the guests got to sip champagne and enjoy the show. It involved ringing bells, pouring champagne, toasting the gods, and breaking bottles. And trust me-- it was as fun as it sounds! To see both ceremonies for yourself click the button to watch the video! It has been a few weeks since the wedding and when I caught up with Ben and Nancy I discovered that they had already made their way to the Bahamas and they plan to enjoy a few days there before sailing her over to Miami. "Our plan for the next year or two is to spend four or five months a year living aboard in the Bahamas, the Keys and the Caribbean. We will do some trips for weeks at a time too while living on land in Jupiter, FL," Nancy revealed. And from there, only time will tell. Head over to SV Mimosa's Facebook page to follow the adventures for yourself!